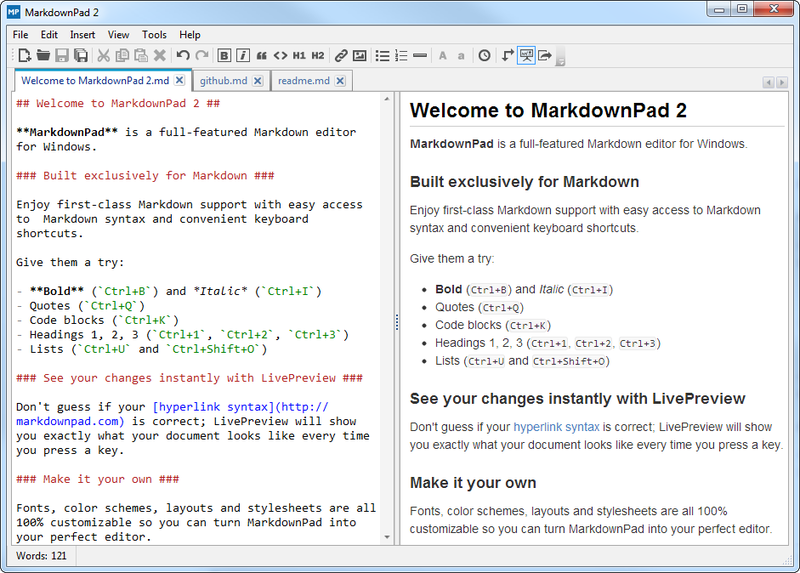 New Markdown Processor: CommonMark! CommonMark is a new Markdown processor aimed at unifying and standardizing the Markdown specification. Added: Task Lists support in the GitHub Flavored Markdown (Offline) processor. Added: Option to customize how many spaces are inserted when the “Use spaces instead of tabs” feature is enabled under Tools → Options → Editor tab. Added: Customization of GitHub Flavored Markdown rendering mode (Enhanced: used in Pull Requests, Issues, and Comments; Standard: Used in READMEs). This option is available under Tools → Options → Markdown tab → Select “GitHub Flavored Markdown”, then locate “Markdown Rendering Mode”. New Language: Norweigan (Norway), thanks to Øystein Bjørke! Improved: Command line arguments now persist across updates if manually triggering the update from the status bar. Improved: Timestamps in MarkdownPad should respect your locale/culture settings by default. These can still be customized under Tools → Options → Editor tab. Fixed: Code syntax highlighting was recently broken due to changes at GitHub. Fixed: When MarkdownPad was opened via command line, relative file paths were being displayed in the Recent Documents menu. Fixed: GitHub Flavored Markdown was adding the prefix user-content- to all HTML name tags due to a change at GitHub, causing issues with anchor links. This prefix is now removed. Fixed: After creating a new document and saving it, “New Document” was still displayed as the Window’s title. 3,966 5,983 Evan Wondrasek <img src="https://www.oldergeeks.com/downloads/gallery/thumbs/markdownpad_th.png"border="0"> May 17, 2018 - 11:12 2.5.0.27920 29.18MB ZIP , out of 12 Votes.